Speaking of magazines, I found this one in a pile of stuff I saved. It featured a neighborhood tour and get together we had in 1991...it was the first effort to tour and promote the houses of Ninety-Eighth Place. It couldn't have been better when in 2005 we had a KCModern Tour of the neighborhood (the houses never looked better) and hosted our special guest, Don Drummond. I talked to him the other day and he said to tell everyone hello...he'll be 95 this October and still seems spunky on the phone. I apologize for the quality, the pages have seen a few storms...Click to enlarge the pages. KCMODERN friend, Scott Butterfield did some serious scan work of 'The House that HOME Built' brochure to let us share it with our readers. The promotional brochure was designed and printed by NBC for participating builders to use in their marketing of 'The House that HOME Built.' Kansas City Modern Builder, Don Drummond gave the brochure to Scott's parents in 1955, when they were thinking about having Don build them a house. Don Drummond signed the back cover for Scott at a soiree during the Drummond Weekend in 2006. Also note the math notation on the last image from 1955 to Scott's parents, "1680 square feet x $15 per square foot = $25,200." That is not a bad price for a Jones and Emmons designed home that was also built by Joseph Eichler. That would be $200,000 to $275,00o in today's dollars depending on what conversion you use. I would hate to have to try to build it today for $275k! As I have mentioned before Jones and Emmons Architects went on to design the X-100 and Case Study House #24 for Joe Eichler. Enjoy 'The House that HOME Built' in all its Mid-Century Modern goodness! Arlene Francis displays a scale model of 'The House that HOME Built' on NBC-TV network show, 'HOME.' Image courtesy of NAHB Archive, NAHB Correlator, October 1955. In Northern California, Eichler homes became as much a part of the landscape as chaparral and live oak trees. Except for a handful in upstate New York, and about 750 Eichler look-alikes in Oregon, Eichler homes never made much impact on the country as a whole. But for a brief time in the mid-1950s, it looked like they might when builders like Kansas City’s, Don Drummond began building their own authorized version of the Eichler home. In 1955, thanks to a popular NBC television show ‘HOME,’ a design that California architects, Jones & Emmons originally created for builder, Joseph Eichler began popping up in 20 or more cities throughout the United States. Jones and Emmons Architects went on to design the X-100 and Case Study House #24 for Joe Eichler. Each house was built by local merchant builders attracted to the program by the free publicity provided by the popular show, sort of a mid-‘50s HGTV. One builder who enthusiastically got behind the program was Donald Drummond, the nearest thing Kansas City had to a Joe Eichler. ‘HOME,’ hosted by Arlene Francis and correspondent Hugh Downs, aired weekdays following NBC’s Today show. It had 2 million viewers, mostly women. ‘The House That HOME Built’ segment, which ran regularly, tried to persuade America that glass-walled, low-gabled, modern homes would work anywhere in the country, not just sunny California. NBC 'HOME' Logo, 1955. Image from HTHB Brochure courtesy of Scott Butterfield. The ‘House That HOME Built’ was co-sponsored by NBC and the National Association of Home Builders. Housing expertise was supplied by C.W. Smith, director of the Southwest Research Institute’s Housing Research Foundation. Rendered image of the 'HTHB' from Pacific Architect and Builder Magazine, April 1955. Courtesy of the A. Quincy Jones Archive and Elaine Jones. Each builder paid $200 for the plans and agreed to build one model to be open to the public. A June 4, 1955 deadline was set to coincide with ‘HOME’s national publicity. The program was likely the brainchild of Eichler, who hoped the buzz generated by the show would promote his own houses. According to the April 1955 article in House and Home, Eichler and Smith persuaded Quincy Jones and Frederick Emmons to design the house. In truth, Eichler had been building early versions of the Jones and Emmons design since 1953. Promotion began when a model of Jones and Emmons’ design appeared on the show, which was broadcast from New York, on Feb. 28, 1955. On the of the NBC set presenting a model of 'The House that HOME Built' with R.J. Caravan of the National Association of Home Builders; Arlene Francis, star of 'HOME'; C.W. Smith housing authority on 'HOME' and director of the Housing Research Foundation of the Southwest Research Institute; and A. Quincy Jones, architect of 'The House that HOME Built'. Image from Pacific Architect and Builder Magazine, April 1955. Courtesy of the A. Quincy Jones Archive and Elaine Jones. Eichler appeared on the show with Illinois builder Bruce Blietz two days later, and Drummond appeared March 25. Commercial television was less than a decade old, but both builders understood its power. “I figured I had about five minutes to sell a thousand houses,” Drummond recalled in a recent interview. NBC 'HOME' Studio in New York City, 1955. Image from HTHB Brochure courtesy of Scott Butterfield. One terrace is adjacent to the public entrance. The other is a private outdoor living area. An open kitchen-living area forms the center of the house, connecting the two legs of the H. Bedrooms fill the rear leg, while a carport and “all-purpose room” fill the front leg, which faces the street. The bi-nuclear plan successfully separates living and sleeping areas. The roots of the home can be found in some of Jones & Emmons earlier plans for Eichler, including the JE- 15, JE-35, JE-51 and the JE-85. 'The House that HOME Built' Plan Courtesy of the A. Quincy Jones Archive and Elaine Jones. A JE-85 clone appears in House and Home magazine in July 1955, and seems to be the immediate predecessor to ‘The House That HOME Built,’ Ernie Braun’s photos for the article were dated April 1955, establishing it as finishing just as the NBC program was starting. Jones and Emmons had designed more than 200 plans for Eichler by 1955 and ‘The House That HOME Built’ seems to be the pinnacle of this particular plan type. Soon Eichler’s focus would shift to the atrium plan. Joseph Eichler's JE-85 on the cover of the House+Home Magazine, July 1955. Unlike earlier Eichlers the post and beam frame and fascia of ‘The House That HOME Built’ extended past the roof eaves to form a trellis-like overhead structure on the side terraces. Image announcing 'The House that HOME Built' program from House+Home Magazine, April 1955. Two things Jones thought unusual were the location of the laundry between bedrooms, and a built-in dining table with two built-in burners and an oven at the end. Jones had recently designed a similar prototype kitchen for Frigidaire. A table cooktop was also included in Jones’ own steel house and the X-100 prototype steel house that he did for Eichler a year later. Rendering of 'The House that HOME Built' kitchen. Image from HTHB Brochure courtesy of Scott Butterfield. The most notable refinement to the new plan was a sliding glass door between the kitchen and terrace. “This blew the whole center of the house open,” says Scott Lane, a Kansas City real estate broker and Drummond enthusiast. Other changes included the substitution of a carport for a garage and revised bathroom locations. Many builders went ahead and included a garage in this house that was already rather luxurious for the time. Eichler and Drummond were masters of merchandising. It is no coincidence that the kitchen, baths and laundry were the focus of changes to the plan. This reflects the power women were gaining over such major decisions as buying a house. Not relying solely on NBC’s ‘HOME’ to reach would-be buyers, Drummond had a local cooking show broadcast from the kitchen of his model home. The show promoted appliances that could be purchased with the home. “There was a nice little profit to be made from the sale of these appliances with the house,” Drummond says. Some of the builders who took on ‘The House that HOME Built’ challenge may have been nervous about the home’s modern touches. But not Drummond. Unlike most of the builders, who constructed only one home, Drummond was soon building several. Bruce Blietz of Illinois had clocked nearly 10,000 visitors to his "HTHB" and garnered new prestige for his firm. Image courtesy of NAHB Archive, NAHB Correlator, October 1955. Don Drummond expected to net about forty sales from his showing of the house on Canterbury Street in Prairie Village, Kansas. Image courtesy of NAHB Archive, NAHB Correlator, October 1955. Cleveland builder, Peter Krutschnitt modified the plan, probably to deal with harsh winters. As seen in a 1955 advertisement for Fenestra Windows, the house was rotated so its entry faced the street, something Drummond did as well. The carport was replaced by a garage, and the roof overhangs were extended to provide protection for rafter ends. It appears that many builders placed the home on corner lots to allow the homes side entry to face the street. Peter Krutschnitt 'HTHB' in a Fenestra Window Advertising Image from House+Home Magazine, September 1955. By late spring the publicity for the homes was beginning to crescendo. The June 1 episode of ‘HOME’ featured a segment showing Thomas Church, one of the founders of modern landscape architecture, preparing planting designs for Eichler. And across the country, builders were hustling. “My father had workmen working day and night the last two weeks of the project,” says Henry Schwier Jr., the son of New Jersey builder Henry Schwier. Henry Schwier of Sea Girt, New Jersey set his model on a 1/4 acre waterfront lot and kept it open for several months. Image courtesy of NAHB Archive, NAHB Correlator, October 1955. On June 3, the day before the homes’ public opening, the entire show was devoted to ‘The House that HOME Built,’ beginning with a race between movers in San Francisco, Chicago, Kansas City, and Denver to outfit the homes with model furnishings. Afterwards, the builders were interviewed about their models. In Flint, Michigan, Robert Gerholtz drew record crowds and wanted to participate again in 1956. Image courtesy of NAHB Archive, NAHB Correlator, October 1955. Not every builder, however, crossed the finish line by June 4. Some builders blamed the delays on a late spring. Others had trouble getting FHA approval for loans. Eichler and Drummond finished their houses on time along with at least seven other participants. Eleven builders were given a second deadline, Sept. 10, during National Home Week. All of the latecomers who finished for this deadline were from Northern States. C.B. Rogers tallied 4500 visitors on opening day alone. Image courtesy of NAHB Archive , NAHB Correlator, October 1955. Most of the builders did well thanks to the program. M.C. (Marcus) Bogue of Denver, Colorado greeted a few of the 22,000 people who turned out for his opening of the "HTHB". Image courtesy of NAHB Archive, NAHB Correlator, October 1955. As it turns out, ‘The House that HOME Built” was unable to ignite a nationwide desire to live in Eichler-style homes. By October 1955, ‘HOME’ was planning new programming for 1956 with New York architect, Eldridge Snyder, designing three less modern models for builders to choose from, including ranch and split level homes. Drummond built one of the single level designs at 98th Place, but it is assumed that Eichler did not participate in the second program. Architect, Eldridge Snyder's Celebrity 1956 HTHB Model had 1325 sq.ft. with two bedrooms, three baths and fit on a 60' lot. This model was built by Don Drummond at 98th Place in Overland Park. Image from House+Home Magazine, October 1955. New York Architect, Eldridge Snyder's 1956 "HTHB" Spacesetter split-level model had five bedrooms, three baths and a laundry. By the late ‘50s, romantic styles trickled into shelter magazines, crowding out the modern. For some builders, ‘HOME’ was their first and only foray into modern design. For Drummond, however, the program was just one step in a career largely devoted to modern home construction. Today, although “Drummonds” have not achieved the mythical status of Eichler homes, they have a dedicated, cult-like following of artists, designers, realtors and architects who appreciate their open plans, post-and-beam structure, and expansive glass. In Salute to the Fall Parade of Homes! The local homebuilders and the Home Builder's Association of Greater Kansas City have been having a tough year...we salute their efforts and see a parallel to this photo. This article trumpets the Parade of Homes in 1957...with a recession looming, builders were "digging in". Don Drummond, the builder, was very busy at the time building numerous modern custom and production homes in the south Kansas City area. He got a great photo-op here, though the site needs a final grading. Clearly the photo was staged; Mr. Quinn holding building plans, Mrs. Quinn in a snappy outfit, the child(who looks like he really wants to get in the dirt) and the family dog in tow. The article says they are moving in this weekend! It's interesting to note the photo promotes the HBA Homes Tour and at the time Don didn't belong to the organization...Talk about "digging in" and positioning at all costs. This is still a cool house, though modified greatly over the years from a stone and timber modern it has the open plan and sophistication you would expect in a 50 year old city home... Here's to Homebuilders and to the economy improving! Back in 2004, co-blogger Scott and I went to California to visit with Don Drummond at his home in Carmel, California. After an entire day of chatting about his years building Modern homes in Kansas City, he began to look for some old magazines and books about his projects in KC. He took us to a hall closet, which had some of his wife's books on design and there was this book with the Revere Homes from Prairie Village, KS on the cover. It was called, Before You Buy a House, by John Hancock Callender. My heart skipped a beat with excitement when I saw it. Seeing my enthusiasm, Don offered to give me the book. I resisted the tempting offer, suggesting that he give it to one of his children or grandchildren instead. I did except his offer on another fabulous book, but that is a story for another day. Ironically, I found the same book on the shelf of Stephen Ritchings, another Mid-Century Modern enthusiast and friend in California later that same weekend. Making note of the title, I immediately ordered a couple copies of this rare title from used book sellers upon my arrival back home. This has proven to be one my favorite titles in my extensive vintage architecture book collection. It has early 1950's homes by many of the great house designers and builders of the time. Most notably. there is extensive coverage of the early Eichler homes by Anshen and Allen and Jones and Emmons in California. Also of note are homes in Hollin Hills, Alexandria, VA by Architect, Charles M. Goodman and Builder, Robert C. Davenport. Closer to home, there are projects in Arapahoe Acres, Denver, CO by Architect, Eugene R. Sternberg and Builder, Edward B. Hawkins. The book is titled Before You Buy a House: How to Judge, How to Value, How to Decide by John Hancock Callender and authorized by the Architectural League of New York and the Southwest Research Institute. Published by Crown Publishing, New York in 1953. 160 pages, 34 Houses and developments, 211 black-and-white photographs, drawings, and plans, and an Evaluation Checklist prepared by The Housing Research Foundation. Because some of these homes will be on the upcoming KCMODERN Runnells Modern House Tour I thought I would share this book with you. Here are the pages from the book pertaining to the Revere Home by Architect, David B. Runnells and Builder, Donald H. Drummond. In honor of KCMODERN's recognition for helping with the first ranch house survey in Kansas, I thought I would post one of our favorite ranch houses. 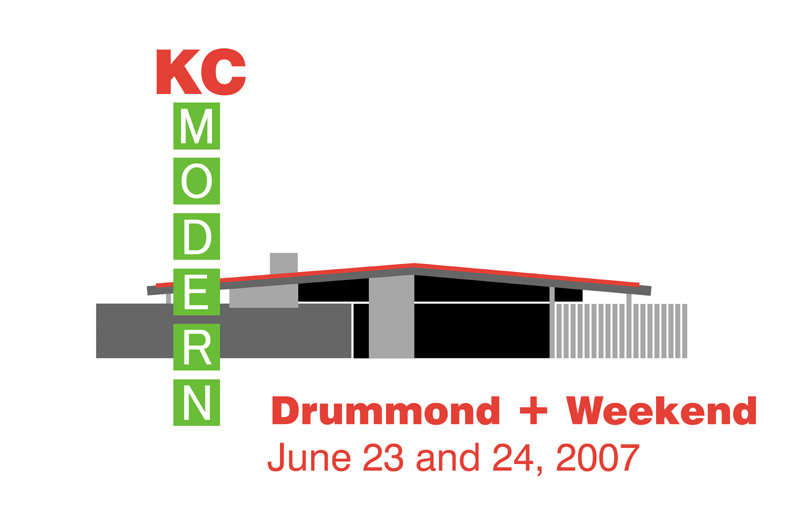 While this photo may look like it was circa 1959, it was really taken on June 24, 2007, during the "Drummond + Weekend" House Tour in Prairie Village, Kansas. This home was designed by Francie Drummond with the help of Gier Sloan and built by Don Drummond at multiple locations in both Kansas and Missouri. The straight version of this house was called the "Home for You in '52" in a 1951, Better Homes and Gardens magazine article. Sometime after that, the design was reworked into this L-shaped version so that it would fit on smaller lots. The car is a 1959 Buick Electra and it belonged to one of the members of the local Buick club. Take a look at some houses currently for sale. In response to the housing demand caused by the disastrous flood the summer of 1951, Francie Drummond designed this house plan (there were variations, Gier Sloan, Architect may have been involved) for quickly built and inexpensive housing. (See vintage photo -- sorry photo is stained) Slab on grade foundations, flat roofs and minimalist styling helped keep costs down. Don said they had no land costs and the homes were sold for around $2,000. He said he built around forty of the houses in Kansas City, KS. They may not exist anymore, we have been unable to locate them, but a nifty little enclave of homes near 55th and Maple, Mission, KS, resemble the flood houses. I remember some were built with flat roofs, others gabled. Now, all have gabled roofs. Comparing the photos and disregarding the gabled roofs, vinyl siding and shutters, you can almost see the flat roof and similar window treatment. Sadly, most have lost their crisp modern styling. I agree with Robert, I'm a big fan of Kivett and Myers work. Though the firm did very little residential work, Ralph Myers designed his own home, as seen here in the newspaper, built by Don Drummond in Prairie Village, KS in 1947. The house featured passive solar heating through the large south windows and outdoor living on the "protected" patio. The recent photo is as close to the angle of the vintage photo as I could get. A privacy fence blocks any view of the alterations that enclosed and changed the original intent of the design. The house has additions and modifications that make it unrecognizable as originally built.